I smiled when I read the theme of this week EF challenge. One thing that occurred to me is about Debbie. Debbie is a nickname that I gave for the bus that drive me to the office. Actually, I have been discussing about this unique bus in this post. And I don’t want to tell about “how is it” again, but I will tell you about “what kind of relationship between Debbie and I”. LoL. When I was a student at Senior High School, I always ride Debbie at least once a month. It’s because my board is in Pupan street (South Jakarta). So, if I want to go home, I had to ride this bus. But, at that time, there is so many bad moments with Debbie. That’s why I hate it very much and when I was graduated from SMA, I said it in my heart “I don’t want to ride this bus again”. And then, after 5 years, I got a job in Radio Dalam, South Jakarta (now, my office have been moved to Lebak Bulus, across to Lebak Bulus Terminal). It’s mean that I have to ride Debbie again. And you know what? I was stolen in Debbie on the first day of work. Huhuhu… OMG. But, that’s all the past. Now, you won’t believe that I have a special relationship with Debbie. I can’t explain too much in English, but what I want to say is “there’s a lot of amazing stories”. Since I ride this bus in every work day, I became familiar with its habit and characteristic, with the Debbie’s crew, the regular passengers and even a plat number in every bus. Yes, even a plat number. And guess what? I have a phone number of a few drivers and condecturs too. *grins* Sometimes, it’s help me when Debbie start to “PHP-in” me. Yeah, sometimes, I should be waiting Debbie for almost one hour in the morning because there is only 8-10 cars in a day. After all, although there is so many weakness in Debbie, now I love it. I love it since 4 years ago and still love it. I love its colour, its characteristic, its habit, but please highlight it: I do not love the crews too. Well, I just feel happy to be friends with them, but not love. Pos ini dipublikasikan di BEC dan tag bec, blog english club, debbie, ef, english friday, love, transportation. Tandai permalink. OMG!! I forgot to change my password on WP.. hahaha..
Hohoho. So you are teasing each other with the drivers? Saya baru tahu lho ada bus seperti ini di Jakarta. 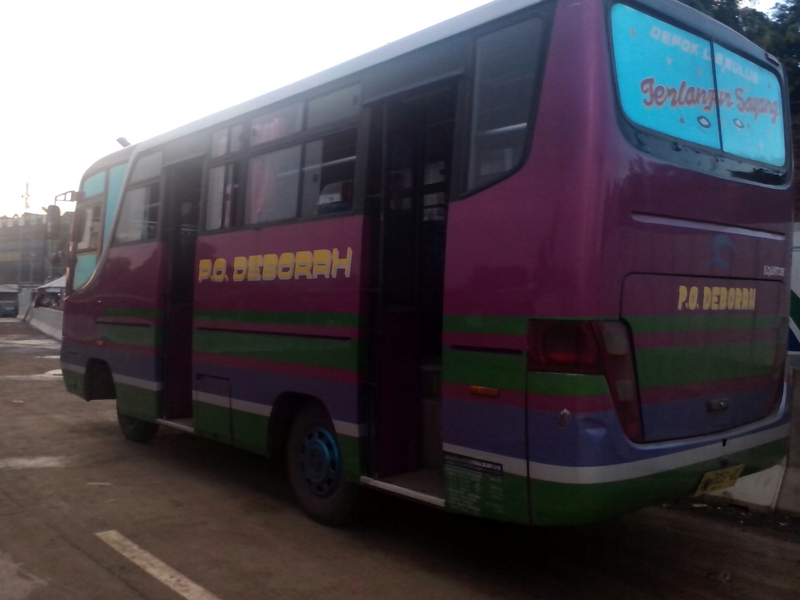 Saya pikir ini bus antarkota antarprovinsi :hehe. ini bis medium macem Metromini gitu, cuman lebih elite (ongkosnya mihil) dan lebih cantik tentunya.. haha..
Selama lebih aman serta lebih nyaman, lebih mahal sedikit menurut saya masih boleh ya :hehe. Iya, memang lebih nyaman kalau kita sudah kenal :hehe.